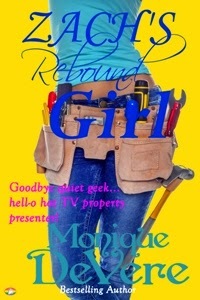 Television property renovator Maddison de la Botella is popular, adored, and on the brink of snagging the opportunity to restore her ancestral home--if a ruthless developer doesn’t tear it down first! Her life has suddenly gone from smooth to bumpy, and it all starts the night she discovers her new neighbour ogling her in her hot tub is none other than Zachary Canady! Her once-upon-a-time best friend and heartbreaker. He’s still way too gorgeous, still makes her heart flip--and still sees her as just a friend. Back in uni, Zach made sure she understood men wanted exciting women. And there was nothing exciting about Maddie. Now ten years on, here’s her chance to make him notice she’s a living, breathing, desirable woman--even if she almost cracks a tooth to prove it. But is it coincidence that as soon as Zach re-enters her life, she becomes curiously accident-prone? Commercial property developer, Zach is about to close the business deal of his career until his past catches up with him, and he’s knocked sideways by the stunner next door. Suddenly he can’t decide what he’s protecting Maddie from--his white-hot desire, or the psychotic stalker out to harm her. I loved it! It's fast-paced, funny, and the perfect book for those that love chick lit. Those looking for a romantic comedy that is lighthearted and sweet will love this book. I highly recommend it.